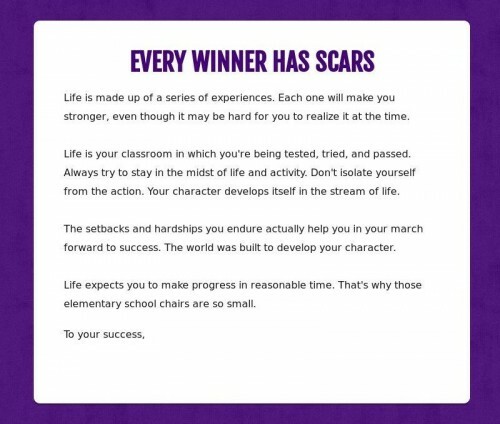 Every Winner Has Scars. Life is made up of a series of experiences. Each one will make you stronger, even though it may be hard for you to realize, it at the time..
Life is your classroom in which you’re being tested , tires and passed. Always try to stay in the midst of life and activity. Don’t isolate yourself from the action. Your character develops itself in the stream of life, The setbacks and hardship you endure actually help you in your march forward to success, The world was built to develop, your character. Check out Motivational and Inspirational Quotes at home page. Life expects you to make progress in reasonable time, That’s why those third grade school chairs are so small. For a daily email update, click HERE or enter your email and stay on top of things by receiving weekly news in your inbox. Sorry! No related posts for you now, please check back soon. 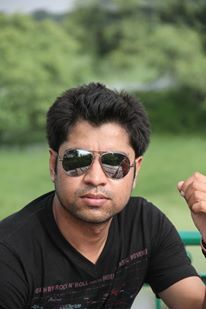 Rajesh, Did not get enough time to write here. Life is lil bit busy. How are you and whats going on man?